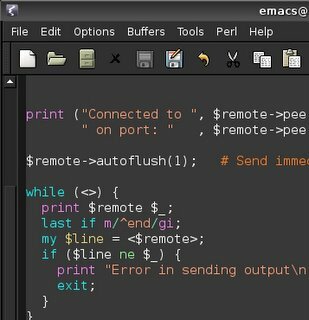 Stephane's Blog: Finally a beautiful GNU Emacs ! I found an Gentoo ebuild package under Gentoo bugzilla, and this Emacs Wiki howto. The installation was not really that difficult, I just had to adapt the cvs server adress and login datas. Not a big thing! It's really a pleasure to use, I can't resist to show you a little screenshot... Still I like to use my emacs in Konsole, because it's totally transparent even if I'm editing on a server at the other side of the world. PS: have you ever used ed, the standard text editor? ?